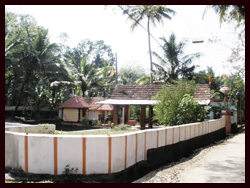 Sree Mahaganapathy Temple was built in the 18th centuary, located at Panniyali, a part of Omalloor- A village panchayat in Pathanamthitta district of Kerala. The temple is unique among temples of central travancore for the beauty and power of the idol of Lord Ganapathy worshipped here. The temple has great relations with the Brahmin family whose members perform pooja at Omalloor Sree Rakhthakandaswamy Temple. The primitive temple has 9 cents of land of its own. The temple was built by the artisans Tamil Brahmins (Vishwakarma), the same people whose work is there behind the structural and decorative works at Sree Rakthakandaswamy Temple. The sanctum of sanctorum is built with hard black rock interlocked without mortar, cement or any solvent materials; a clear evidence of the adroitness of the workers of south india. The idol of Lord Ganesh (Vigneshwara) worshipped here is unique of its kind with a height of 1.5 feet. The sculpture is in a form without wearing any ornaments but the spirituality emanating from it is breathtaking and aesthetic. The temple, in the early period owned and managed by the Mullassery family was handedover to Meppallil family. The members of the Meppallil family handed over the Temple and the land it occupies to a Trust without any reciprocation. It was after this incident in the year 2006, Sree MahaGanapathy Temple Trust was formed by devotees in the region. The management is entrusted to this governing body, since then. For the last few decades and even now the Mullasery family members continue to perform the pooja here.